Ukrainian Radio Symphony Orchestra is widely acknowledged for its artistry and well-known in Ukraine and abroad. For many decades Orchestra’s activity was a great contribution to national music culture treasury. 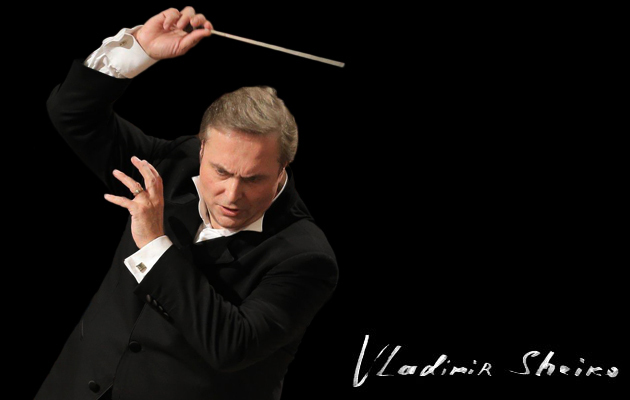 Since 2005 Symphony Orchestra has been led by Vladimir Sheiko – Chief Conductor and Art Director. He opened the new page in artistic activity of the collective. The first public performance of the newly created Ukrainian Radio Symphony Orchestra (Ukrainian Radio-Center at that time), which was a notable even in the Ukrainian art and cultural life, happened on the 5th of October, 1929. The Orchestra was a part of the Radio-Theatre and consisted of 45 musicians. The head of the Orchestra was a talented conductor and Professor Yakiv Rozenshteyn. The best musicians of Kharkov, the former capital of Ukraine, were invited to the Orchestra. Here is one of the articles of that time: "The historical days happened for the Ukrainian Radio-Center on the 5th and the 7th of October, 1929. What used to be a dream came true. The first Radio-Theatre was opened in Ukraine. These two performances were the first attempts of the musical art radio broadcasting. The Radio-Center’s Symphonic Orchestra had made a special impression among all other performers. Even thought the Orchestra was composed of the best musicians, conductor and Professor Rozenshteyn made it disciplined and improved musician’s teamwork in such a short period of time so one might be surprised. This gives us a hope that the Radio-Center’s symphonic Orchestra will become the best musical unit in Ukraine" ("Evening Radio", newspaper. October 8, 1929). The Orchestra had started its first symphonic cycle with the P. Tchaikovsky works, which was opened with the 5th symphony and the 3rd orchestral suit on the 14th of October, 1929. This was the beginning of the Ukrainian National Musical Radio Broadcasting history. This was followed by 85 years of the bright creative Orchestra life, full of high art and inspired labor. Due to the transfer of the Ukrainian capital to Kyiv and Republican Radio Committee reformation the Orchestra was removed to Kyiv and the number of musicians increased up to 60 persons. By the year of 1937 it becomes the only stationary Symphony Orchestra in Kyiv which practiced purely in symphony music. Musician’s hard work supervised by the best talented chief conductors has led the Orchestra to the highest level of the orchestral art. Herman Adler, Mykhailo Kanershteyn, Petro Polyakov, Kostyantyn Simeonov, Vadym Gnedash, Volodymyr Sirenko and Viatcheslav Blinov formed the collective while polishing its mastery and improving themselves together with the Orchestra. The Orchestra was tempered in a collaboration with the prominent conductors of the 20th century: Genadiy Rozhdestvenskiy, Nathan Rakhlin, Oleksandr Klimov, Stefan Turchak, Benjamin Tol'ba, Isaac Pain, Mykola Kolessa, Fedir Gluschenko, Rikkardo Kapasso, Arild Remmerit and others. Symphony Orchestra is bases and produces records in one of the biggest recording studios in Europe – Big Concert Recording Studio of Ukrainian Radio. Radio broadcasts and public concerts as well as the thousands of world and Ukrainian music records and the movie records made by the Orchestra became an enormous contribution to the national culture treasury. With constant success Orchestra performs in biggest music halls of Ukraine – National Philharmonic Society of Ukraine, National Palace “Ukraine” and National Opera of Ukraine. Participation of world-wide known opera singers and performers-instrumentalists such as Jon Lord (composer and pianist of “Deep Purple”, England), Keiko Matsui (jazz pianist, Japan), Anatoliy Kocherga (bass, Austria), Oleh Krysa (violin, USA), (Anatoliy Solovyanenko (tenor, Ukraine), Zurab Sotkilava (tenor, Russia), Tatiana Grindenko (violin, Russia), Victoria Mullova (violin, Austria), Liana Isakadze (violin, Russia), Alexander Knyazev (cello, Russia), Vladimir Krainev (piano, Germany)became a real concert decoration. Repertoire of the Ukrainian Radio Symphony Orchestra contains a lot of masterpieces of Ukrainian and world classics. Art projects are made in collaboration with lead music and art collectives of Ukraine such as National Academic Choir of Ukraine “Dumka”, Ukrainian Radio Academic Choir, Ukrainian National Folk Choir named after H. Veryovka and others. Ukrainian Radio Symphony Orchestra regularly takes part in international festivals “Kyiv Music Fest” and “Music Premiers of the Season” where it has performed a lot of works of famous Ukrainian and world authors. The title of “Honored collective of Ukraine” and the “Academic” status were granted to the Orchestra for special merits in the musical art development.